Albeit his extreme views sometimes, Taleb is interesting to watch. He is the author of the widely popular book “The Black Swan”. In this interview, Taleb calls Ben Bernanke ‘procrustes’, Greek word for Dr. stretcher. Interview of Stephen Roach, former Chief Economist at Morgan Stanley, Chairman of Morgan Stanley Asia, and now a professor at Yale University. He’s teaching Chinese Economy there. What’s it like working in the White House? Bob Shiller, economics professor at Yale University and a pioneer in behavior finance talks about the importance of confidence in economic recovery. He thinks with lingering high unemployment, the national morale is sinking. And we have to admit we simply do not know many things in the working of our economy. 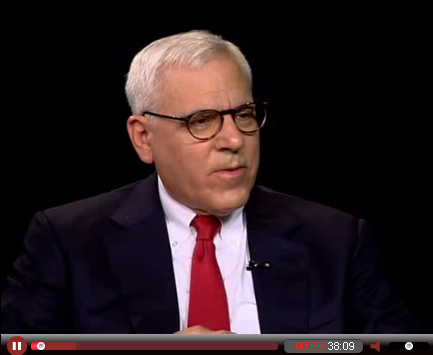 A very intriguing interview of David Rubenstein, co-founder of private equity firm The Carlyle Group. He talks about current economic challenges, the performance of Obama Administration, and US’ strategy to deal with a fast rising China. Rubenstein’s firm is the most active PE firm in China. Something most interesting to note is Rubenstein is also the owner and collector of Magna Carta, probably the most important historical piece documenting the development of Western property rights.